Get cavity protection and strengthen your teeth with this personal sized Crest toothpaste. With regular brushing, Crest Cavity Protection Toothpaste will help fight cavities and leave you with fresh breath. These travel-sized toothpaste tubes are perfect for the hospitality industry or for take home bags in Dentist offices. Yet they can also be used for personal use, easily thrown in a purse, briefCarton, work drawer or travel bag. Each carton includes 240 personal size tubes. Call today to order. Stock up and save big! 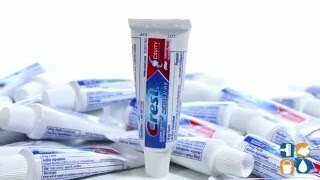 Crest travel size toothpaste is used for our charity to give to area children in need! This product is used in vending machines. Product will be used in ministry program -- Room in the Inn -- where we provided shelter for 10 homeless men one night each week. Each person is provided with a personal toiletries bag which includes the small size tube of toothpaste. We are using the toothpaste as gifts in Operation Christmas Child Shoeboxes.